2000 ProSport 2200WA Offshore walkaround, aluminum 2 axle trailer, Suzuki O/B 140. All Composite Construction, no wood to rot. Very good condition, Sunbrella top 3 yrs old. Excellent in rough water, used on Lakes Ontario and Champlain all weather, runs great, will do 30-32 knots all day long. Lowrance FF. Located on Lake Champlain just N of Burlington VT. Retiring from boating, priced to sell!! $8750. Please call 8AM-8PM: 607 Seven 5 four zero zero 3 one. thanks! Hi Heath- yes it does, I forgot to put it in the picture! I may have the transducer as well at my summer place but can't get there any time soon, if I do find it it will be included but can't guarantee that, so I'll sell everything for $200 as-is. Roger A. No, if it did price would be $300. Will sell without for $200 + ship or you pick up zip 13760. 19 ft Crestliner Sabre V195 19' 0" all-welded aluminum boat set up for fishing, 96" beam, 30" deep. 3 downriggers, Lowrance Elite, Bimini top, good trailer, controls and gauges, kicker bracket, weight 1400 lbs. NO motor (takes 70 to 150 hp long outboard), boat in very good condition, no dents to speak of, bottom very clean, floor replaced 2 yrs ago, transom also rebuilt at that time for larger hp motor. Used in Lakes Ontario and Champlain only. Upgrade your boat and re-use your old motor, goes good with only 70hp! ! Great boat, selling only to buy pontoon (getting old!). 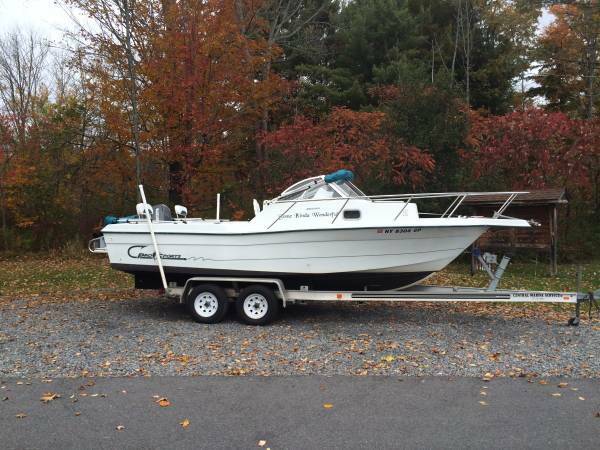 Located near Burlington VT. Price: $2600 with all equipment and extras, $2000 Firm with-out fish finder and downriggers. Please call 8AM-8PM if interested: 1-607-754-zero zero three one. Some pics show a Johnson 3 cyl, some an Evinrude, originally a Chrysler? The OMC 3 cyl outboards were one of the best ever made imho. What's on it now? I was not aware of this, but nothing to do with tuning or maintenance, which is always by the book, it was fine when pulled out in fall, power trim was fine when the lower unit fluid changed. Evidently there's a short in the trim we weren't aware of from winter storage that affects the starter. Should have started it in advance before trying to demo but it had been raining, otherwise it would have been fixed first, stuff happens with boats, it was not anticipated or would have been corrected, now that we're aware it'll be corrected before it goes. We'd never leave the dock in a vessel not ready, Dad was a Navy man that has always been the way things are done.. Selling because we've bought an aluminum 19 for easier trailering from NY to VT. I'm 300 miles away, I have no idea what my son did or didn't do this morning, but the boat has been maintained as I said and it will not leave my yard unless ready. Exactly, outboards are easier to deal with on every level. I worked as a marine tech on Lake Champlain for years when off summer from teaching HS science, and got sick of dealing with I/Os and their issues, everything is more complicated. I've never owned an I/O and never will. My daughter bought a used 4 Winns 18'' I/O against my advice and 2 years later she regretted it when the stringers and engine supports went bad.